@ScarfaceREDUX directed by YOU – make a 15 sec video clip for @BorschtCorp screening party IN MIAMI! I been out of touch on here for a while but I had to stop to pop this post up because my crazy vatos in Miami are prepping their sick @BorschtCorp Festival (Dec. 17-21) and YOU CAN BE A PART OF IT by participating in this insanely rad crowdsourced project remaking the iconic film #Scarface. How does it work? Go HERE pick out a 15 second clip, then remake the scene however you want, with sockpuppets, animation, children, cats or good ol live action on your iPhone, GoPRo or whatever you got around. Send it to Borscht, they’ll upload to their social media people will vote and you’ll get a piece of cred when your clip ends up in the final re-imagining of Brian DePalma’s classic AND based on how many votes you clock, you just might win 2 tickets to party in Miami. 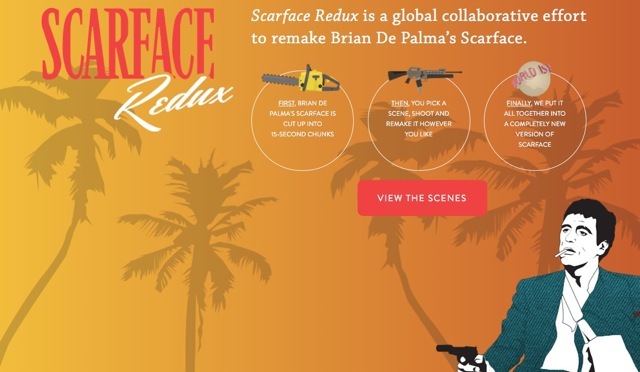 More info on the site: scarfaceredux.com. Read more about the balls to the wall festival here. So whatever your doing this weekend PUSH IT TO THE LIMIT. Because its Due Monday December 8th at 11:59pm. I already picked out the clips I’m doing (ice cold Michelle Pfeiffer)!